Expert handling and recycling of catalytic converters is what allows Federal Autocat Recycling to pay back significant cash values to our catalytic converters customers. Our ability to extract more precious metals from each load allows us to give more back to our customers. Plain and simple. Federal Autocat Recycling recovers Platinum Group Metal (PGM) values from used catalytic converters. We purchase end-of-life metallic and ceramic monolith and bead catalysts from emission control and air pollution control devices. We also accept carbon supported catalyst and other process control scrap catalyst materials. 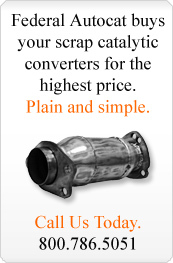 With over 75 years of cumulative experience in catalytic converters recycling, we will evaluate your catalyst material rapidly and return cash for your scrap, sometimes within 24 hours. We specialize in the difficult extraction of PGM values from metal substrate or 'foil' catalyst elements, using proprietary and environmentally friendly technology. Contact us to learn more about our scrap catalyst materials recycling program.